Last week, I wrote about how little I actually know about geology. But, still, I am resolved to understand something about where my beloved Colorado Plateau came from. Here is what I have puzzled out. The Colorado Plateau is a big chunk of craton (a great word I originally learned from John McPhee...whom I will get to in due time). Craton is defined as crust that hasn't been affected by mountain building for at least a billion years—and you thought your home town had nothing going on. Cratons can either be shields, where old metamorphic and igneous rocks are on the surface (the Canadian Shield, for example), and cratonic platforms, where there are sedimentary rocks piled up on top of the thick ancient rock. The Colorado Platform is a roughly circular chunk of cratonic platform, surrounded by mountains. Its thick basement rock is covered with many layers of sedimentary rock. And it has rotated a bit clockwise, which has opened up a rift valley to its east, the Rio Grande Rift, through which the river of the same name now flows. 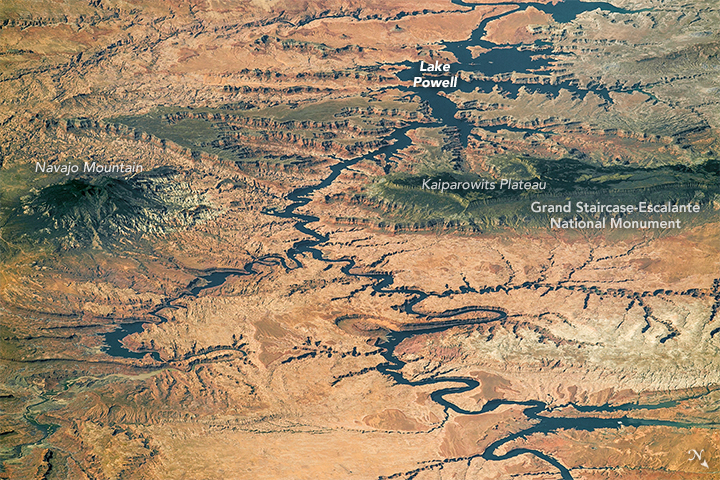 About 17 million years ago, the Colorado Plateau kind of bobbed up, causing a big increase in erosion. Snow fell on its higher elevations, increasing the amount of water flowing in a dry environment. A lot of other stuff happened over that time, of course, from hot spots that punched mountains through the cratonic crust to salt valleys. And what caused the plateau to rise up like that is a subject of some debate. In the future I'll get to a popular possible cause, involving a disappearing tectonic plate, which resulted in, among other things, the anomalous position of the Rocky Mountains (no, I did not realize their position was anomalous either). None of the geology books I own about the specific geology of the Colorado Plateau ever use the word "craton", or ever bother to explain, in basic terms, what makes the Colorado Plateau the Colorado Plateau. They mostly give a quick overview of rock types, geologic processes, and geologic time, and then launch into insanely detailed descriptions of the origins of Navaho Sandstone and the Ali Baba Member of the Moenkopi Formation. That's fine, I guess, but it never got to what I wanted to know, which was what was different about this place. If they'd just said "it's kind of like a raft of ancient rock, separate from the Basin and Range and mountain areas around it, a raft covered with layers and layers of sedimentary rock, which got pushed up and started to erode much more quickly", I'd have had an image to hold on to, a way of organizing my thinking. But I'm not expert. And, as I said before, geologists either seem to write about the Colorado Plateau, or everything but the Colorado Plateau. John McPhee, in his many books about geology over the decades, collected a couple of decades ago into the omnibus Annals of the Former World, mentions it only once, while discussing something else. A lovely book called Rough-Hewn Land, by Keith Heyer Meldahl, is subtitled "A Geologic Journey from California to the Rocky Mountains" and taught me a lot, but deftly dodges around the Colorado Plateau in its eastward journey in an almost perverse way. By that point I was taking this kind of personally. Sometimes it would appear on a map, but not be mentioned in the text. Sometimes it would lurk just off the edge of the map. There was almost a feeling to trauma to the whole thing, as if something so horrific had happened there that no geologist could manage to even remember having learned about the place. My Essentials of Geology by Stephen Marshak, a book I have found quite useful, actually does mention the Plateau, and points out its cratonic nature in a map of the cratons of North America. But it too does not spend much time on it. So a lot of what I have here I've kind of pieced together. The Colorado Plateau is a raft, or a cork (I like that because it's roughly circular), a block of rock of long standing, which has been a single unit for a really long time, has gotten covered with sedimentary rock and partly eroded quite a few times, but only in recent eras has floated up so high that it has eroded in a way that makes it so cool to visit. I'll get into more detail on that when I get a chance. What happened among those geologists? Was there really some terrible disaster that left most geologists denying that there even is such a place, while sunburned, dust-spitting characters in worn boots stumble out of the dry wilderness with improbable tales of the De Chelly erg and the Dewey Bridge Member while never really getting clear about where they have been? Do these two groups talk, or do they carefully never acknowledge each others' existences? There is a story here, of course. If necessary, I'll make it up. Do liberals actually care about climate change? Or is it just a weapon in the eternal political war everyone seems to find so interesting? Most writers know way more different words than they use, though there are the occasional outliers who use way more words than they know. That's because writers like readers, and many readers do complain when a writer uses a word they don't already know, as if any of us already knows all the words we will ever know. Has this changed with online dictionaries easily linked to the actual text being read? A Kindle lets you look up a word instantly. I would be interested to hear if anyone has done a study of whether people are now more willing to attack a "difficult" text, knowing they won't actually have to get up and go open a dictionary when they hit an unfamiliar word. Allusion assistance can't be far behind. This is all by way of my getting to a cool word I learned today (via a story about rain on The Dish): petrichor, the earthy smell of rain when it first falls on dry soil. The name was made up in 1964 by two Australian researchers, and comes from the Greek words for stone (as in "you are Petrus, the rock on which I will build my church") and ichor, the word for the fluid in the circulatory systems of the Greek gods, which got used by H. P. Lovecraft and people imitating him for the circulatory fluids of aliens and other creepy creatures. It's not a very mellifluous word for such a sensuous, specific concept. If I do use it, no doubt tying it to a specific memory a character has, I will probably define it, just because this really is one of those "there's a word for that?" words. The real question is, when is the menace of researchers administering electric shocks to anything that moves, and many things that don't, going to end? I mean, look at that poor thing. They should be ashamed of themselves. But, now that they've done it, it is another indication about how much our minds depend on relatively simple structures evolved millions of years ago, sometimes for other purposes. And those ancient creatures evolved relatively complicated ways of judging and reacting to reality. That evolutionary environment didn't contain nasty researchers with electric crawdad prods, but it contained things just as nasty. That's a difficult thing about coming up with a genuine alien. It's not that species that's alien, its the entire lineage it comes from. The reactions come from choices made deep in the forgotten past. Once you start thinking of the complexities of that, you'll never get off the ground. For centuries there have been occasional accounts of free-floating spheres of light, sometimes destructive, that occur during thunderstorms. These are one of those mysterious phenomena people like to spend a lot of time speculating on. I always figured they were something like afterimages of lightning flashes, narratively exaggerated in the confusion of dangerous storms. But a story in New Scientist indicates that they may be actual brain effects, with strong fluctuating magnetic fields resulting in electric fields that cause neurons to fire through transcranial magnetic stimulation. A fast series of lighting return strokes can actually manipulate your brain into seeing something that's not there. By this theory, ball lightning isn't real, but it's not made up either. It's a shared brain effect caused by magnetic fields. A camera would show nothing. Charming, though I don't believe it. But it's interesting to think what other effects might result from shared manipulation of neurons, and what the cultural effects might be if it happened with fair frequency. "Alarm fatigue": is the Facoder a solution? A recent Boston Globe story related how a patient died at Mass General because various monitors were either beeping and unheeded, or had been turned off. When alarms are going off constantly for non-critical matters, you become desensitized to them, or even interfere with their function just to have some peace and quiet. Then, when the real critical matter comes up, you ignore it, and your patient dies, or the reactor overheats, or the train goes through a switch and crashes. To improve things, you'd have to decide ahead of time which things are critical, and which aren't, and make sure the alarms reflected this priority. Only a few problems would qualify: the mind can't pay attention to more than a couple of things at once. You'd need to make sure less-critical but still important problems get bumped up for investigation periodically. But if one of those "non-critical" problems then causes a death, you, the alarm designer, are in real trouble. And you know that somewhere, at some time, that will happen. What really matters is not what makes sense, but what you can be sued for. The problem, however, was solved years ago by David E. H. Jones, who wrote a wonderful column for New Scientist called "Daedalus", about bizarre yet plausible devices created by a company called DREADCO. I have a collection of these columns, long out of print, called The Inventions of Daedalus, which includes a column on the Facoder, from 1973. My copy is not inscribed, but I remember it being given to me by my old friend Dave Platt, with whom I have recently reconnected. Thanks, Dave! Here's the principle of the facoder. Unless they have some autism-spectrum disorder people respond to human faces with subtlety and complexity. They instantly gauge moods, even with limited cues. Even simple caricature faces can convey these emotions. Using the example of a control panel for a complex chemical plant, Daedalus proposed a "facoder": a display of schematic faces, instead of dials or other readouts. As a specific system started to malfunction, the face would look more and more alarmed, instantly attracting the attention of the monitoring engineer. The entire mood of the plant could be gauged with a quick glance across the display, much as a performer gauges the mood of an audience (this is my analogy, not Daedalus's, BTW). A bank of happy faces would be the reward of good management. The same thing could be installed a a nurse's station, with faces standing in for patient vital signs. In a hospital setting, unlike the chemical plant or nuclear power plant, these would be competing with real patient faces, so it would have to be used with due consideration for the human desire for emotional shortcuts. I'm actually surprised some version of the facoder hasn't come to pass. I think its time has come. Steam engine time for intelligence? it seems to be steam-engine time for intelligence. We're smart, but so are cephalopods, dolphins, crows, parrots, raccoons, and of course the great apes. Humans just got across the finish line first. It's not surprising, really. Darwinian selection puts a kind of "ratchet" on random variations in brainpower, so I'd expect the trend to be generally in the smart direction. Especially since there's no "half a wing" problem with intelligence -- being smarter than the average annelid is just as much an advantage as being able to master language and tool use. Is the smartest example of any phylum smarter now than in past eras? How gains in smartness transfer across great extinction boundaries isn't completely obvious. Being smart is no defense against getting hit by an asteroid, or having the seas turn anoxic, or whatever global cause kills almost everything. The smartest don't survive in that case--though those that do may gain some advantage in the disordered environment following the catastrophe. So I'm on the fence about whether you'd always expect the next era to have higher peak smartness than the previous one. If you drop primates out of the analysis as an outlier, are the remaining peak smartnesses higher than they were in the Cretaceous? Are we really in a world ripe with smartness? If so, is there any reason for it aside from ratchet effects? On The Big Questions, Steve Landsburg addresses a perennial SF question: how likely is evolution to evolve? He quotes a review by an astroscientist Charley Lineweaver of a book called Intelligent Life in the Universe, where Lineweaver eloquently denounces what he calls the "Planet of the Apes Hypothesis", or convergentism. In the movies "Planet of the Apes", humans are wiped out, and various great apes evolve toward intelligence, making it seem inevitable that intelligence will evolve. Lineweaver cites what he calls five natural experiments whose result oppose this conclusion: the island continents of South America, Australia, North America, Madagascar, and India. Intelligence did not evolve on any of them. There is nothing convergent about the evolution of intelligence, nothing inevitable. Let's leave aside the fact that "Planet of the Apes" is more satire than investigation of evolutionary process (talking animals, like Jonathan Swift's intelligent Houyhnhnms, are a staple of satire), and consider what might or might not be convergent in evolution. Certain things seem to be widely applicable. Eyes, for example. There are so many eyes in the world, working so many different ways, that you can say evolution converges on them. Wings too. Birds, bats, insects...the damn things are so useful, that they often evolve. Not everything needs them, so not everything has them. Intelligence...not so much. It's clearly not as useful a gadget as eyes or wings. But, leaving various hominins aside, has the outer edge of intelligence been pushing upward over time? Hominins are a statistical outlier, but can we say that the most intelligent species on the planet in, say, the Oligocene was more intelligent than the most intelligent species of the Jurassic, which was more intelligent than the most intelligent species of the Ordovician? Hard enough to tell what body parts those things had, much less what their behavior must have been like. From my limited knowledge, I'd say that Jurassic beats Ordovician, but it's harder to prove that Oligocene beats Jurassic. If there was another mass extinction, including us, would the next go-round create an even more intelligent species, or are we just a fluke? Can anyone think of a way to confirm or deny the hypothesis that the "smartest thing on the planet" has been getting smarter through time? Via everyone's favorite drug discovery blog, In the Pipeline, the news that the rats and mice we depend on to understand the effectiveness of drugs and other metabolically significant interventions are pathetic, out-of-shape, metabolically deranged lardballs. The authors of the study paper describe your typical laboratory rodent as "sedentary, obese, glucose intolerant, and on a trajectory to premature death". This matters because almost every metabolic pathway is affected by this situation: "cellular physiology, vulnerability to oxidative stress, inflammation, and associated diseases". Of course, as everyone instantly points out, this makes these rodents excellent subjects for testing drugs and procedures intended for our increasingly sedentary and obese population. But no one should be happy about that. At the very least, we should know when a drug has been tested on (or controlled against) a rodent with a stressed metabolism, because its effect in normal-weight humans might be quite different. And there are still some of us around. "Sedentary and obese" is a different state than "active and normal weight". The differences are many, sometimes unexpected, and often profound. Being sedentary and obese has many unpleasant side effects: note the "trajectory to premature death" part. The differences between "sedentary and obese" and "active and normal weight" are negative, not neutral. It's easy to become sedentary and obese. It doesn't require television or ads by snack companies. As a result, changing from "sedentary and obese" to "active and normal weight" will no doubt entail a huge amount of work and cost from the managers of these animals. What distinguishes us from lab rats is (presumably) our conscious ability to alter our circumstances. Don't be a lab rat. Rockets stopped being entertaining long before we actually managed to land on the Moon, but it seems that the Russians are working on ways of making them fun again. Just think: mysterious blue spirals in the sky! Who needs the things to actually do anything? I remember reading the people in northern Russia always saw a lot of UFOs, because the secret cosmodrome at Plesetsk fired off all sorts of rockets without ever informing anyone of the base's existence. NASA has been much less entertaining of late. However, the most interesting phrase in the story I linked to is "Celebrity astronomer Knut Jørgen Røed Ødegaar". This guy could get a reality show just based on that attributed title and his name alone. From Peter Frost, of Evo and Proud something I've read about elsewhere: that we really do tend to think of someone as having a "warmer" personality if we are holding something warm, and that washing really does make us feel less guilty--Pilate was on to something. Frost thinks this means we are reusing neural pathways evolved for other purposes, which explains the seeming high heritability of complex and recently evolved behaviors. I think we've only just started moving toward an understanding of where our sense of the world really comes from. Us rational nerd-type folks were irritated during the Science Wars (remember them? I suspect we have an armistice, but not a permanent peace) with various postmodern views of the scientific enterprise, including social construction and feminist epistemology, and were delighted by daring forays into the enemy's territory, like Sokal's Hoax. After all, when we write hard SF, we try to base it on reasonable modifications to the current scientific understanding of the universe. We do assume there is such a thing, and that it has something to do with the actual universe. The recent furor over the stolen emails at the Climate Studies Unit at the University of East Anglia shows that the "current scientific understanding" of anthropogenic global warming is not socially constructed, but may be a bit slipperier than might seem at first. Modernity's great generators of knowledge and wealth--trade, science, democracy--all involve managing the natural human urges to cooperate with those closest to us (thus building long-lasting personal bonds) in order to allow for large-scale anonymous information-maximizing transactions (thus making us richer and smarter). Refusing nepotism, cronyism, and groupthink isn't easy. It violates all our natural hunting-band ingroup/outgroup default mental habits. So there is nothing weird or incomprehensible about what happened at the CSU, but there is nothing admirable either. Keeping objectivity is a constant struggle, because we so hate its results. Any coherent mental practice eventually leads to a result you are emotionally uncomfortable with: it's a sign (thought not a guarantee) that you are maintaining consistency. The CSU community seems to have gotten to like each other a bit too much. For much of the louder part of the world, of course, the truth or falsehood of AGW is not the issue. Coalition is the issue. AGW has no more objective meaning to such people than the presence or absence of Filioque in the Creed, or Socialism in One Country, or wearing white after Labor Day (and, yes, I know people have died, at least for the first two, so I am aware such issues can lead to bloody results). But we can't worry about the voices of those people when we are seeking some kind of knowlege. Ignoring them can sometimes be the hardest part of true science. What happened at CSU might be "inevitable". But so are plane crashes and house fires. We do our best to make sure they happen as infrequently as possible, with as little loss of life as possible. Language Log is one of my favorite blogs, even though (or maybe because) they regularly demolish some cherished bit of usagism on my part. And they don't like Strunk & White either, and all writers take an oath to cite S&W when talking about clear writing, even if they have never done more than read other writers' references to S&W. It's kind of like a secret handshake. And now that you know it, you can do it too. Just don't read LL, or you'll feel like an idiot when you do. Anyway, that wasn't the point of this. Really. The point was a post on Conversational Incongruence, which, as LL often does, springboards off the online comic xkcd, because eventually xkcd distills any zeitgeist idea into witty conversational exchanges between stick figures, and LL is on hand to provide linguistic exegesis. In the comments, various people recalled conversation divergences they had experienced, and I did too: a rare triple divergence. Once I was having pizza and beer with two friends: a veterinarian and a politically active minister. We got to talking about "AI". Each others' responses made less and less sense, until we realized that the vet was talking about artificial insemination, the minister about Amnesty International, and I about artificial intelligence. What was the conversation "really" about? Do any of us, who often spend a week hiking together, actually listen to what the others have to say? Is there a series of veterinarian/minister/science fiction writer bar jokes none of us have ever heard? Do you have any idea of what I'm talking about?